If you’ve never had a salmon patty, you are missing out! The recipe that I will be sharing with you today is free of wheat/gluten, eggs, dairy, and nuts. *Some of the ingredients I used may contain soy, but if you are avoiding soy, this recipe can be easily adapted to be entirely soy free as well. The breadcrumbs I used are manufactured in a facility that processes soy; if this is a concern for you, you can use any brand of breadcrumbs that are free of your allergens (or make your own using your favorite “safe for you” bread). The mayo I used may contain soy, but you can substitute a soy-free vegan mayo, such as Earthbalance Olive Oil to be certain your patties are soy free. One of the best things about this recipe is it’s simplicity. The patties themselves only contain four ingredients, and the preptime involved in making them is minimal (it took me about five minutes to mix and shape the patties). The most time consuming part is frying them, but even taking that into consideration, this makes for a relatively quick dinner. I like these best served with rice, and steamed veggies, but they go well with just about anything. And fried until golden brown. Sounds easy, right? It really is, but don’t let the simplicity fool you–these are delicious! Check out the recipe below, and be sure to let us know how it goes if you give these a try! 1.) Spoon the canned salmon into a large bowl. Remove any skin or large bones, and crumble any large chunks of salmon. 2.) Add Old Bay, Breadcrumbs, and mayo to salmon, and mix until thoroughly combined. 3.) Heat oil in a large non-stick pan over Medium heat. 4.) While oil is heating, shape the salmon mixture into patties. If your mix feels to dry, and you consequently have trouble forming your patties, add a little extra mayo. 5.) Fry patties until golden brown on both sides, flipping once. When patties are done, transfer to a plate lined with paper towels. 6.) Allow to cool briefly before serving. Enjoy! NOTE: Please check (and double check) any and all labels for your allergens before you consume a new product if you (or your child) has a food allergy. If necessary, call the relevant manufacturer to confirm that the product is safe for you (or your child) to consume. Please consult your (or your child’s) doctor before making any dietary changes. While I hope that all of you reading this will find the information and recipes I supply to be helpful, this information is not intended to in any way replace, or supersede, the care and advice of your allergist, nutritionist, dietician, or other medical professional. 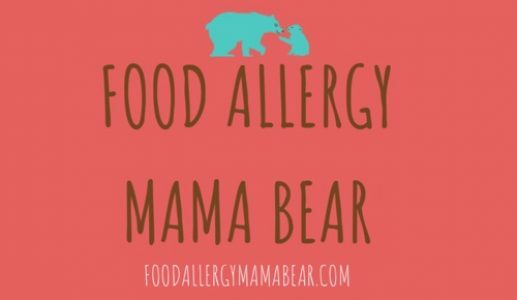 Previous Post Food Allergy Mama Bear is Now on Pinterest! Oh yum! These look awesome! !